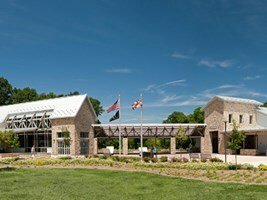 Named one of The 15 Most Beautiful Rest Stops in America by Architectural Digest. Serves traffic heading toward Baltimore and Eastern Shore as well as points south. I don't care for the new welcome center. The old one was more welcoming and woodsy. This new one is too modern, cold, and bright. That's progress..I guess. Excellent Rest Stop & Welcome Center with PLAYGROUNDS!